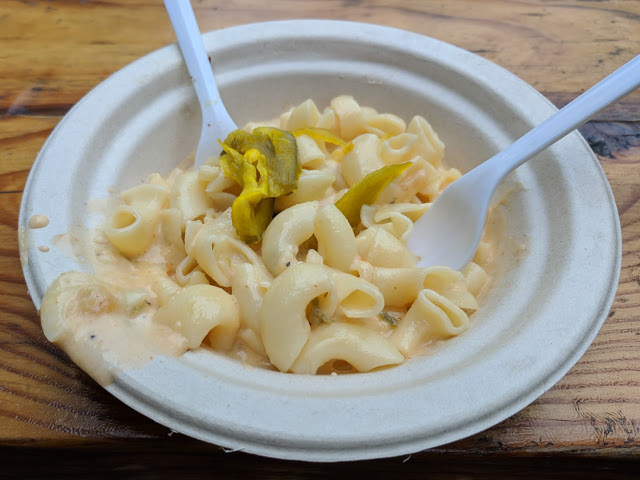 So, the first Mac that Nikki and I tried was a simple dish from the Jackrabbit food truck. 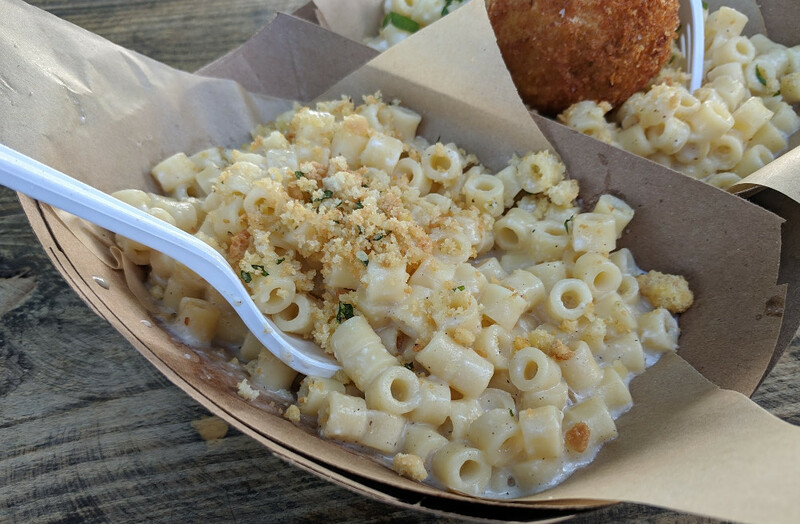 Jackrabbit's "Almost Famous" Mac and Cheese. I got the "Almost Famous" Mac and Cheese, and Nikki got the "Over the Top" one. 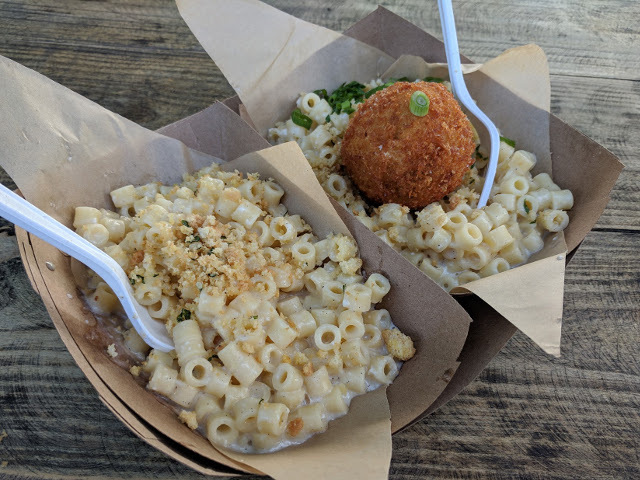 Both dishes use the same Jack, Cheddar, and Gruyère cheese blend, but Nikki's dish came with a Mac and Cheese ball on top! Flavor-wise, the Mac was pretty good. The sauce was a little runny, and probably could have used a little more salt. But the cheeses themselves were solid, and the breadcrumbs imparted a pleasant herby crunch to the dish. However, the Mac and Cheese ball was freaking amazing. Their Mac definitely did well in ball form. :) Overall, I'd give this a 3 or a 4 out of 5. After that, we tried a "Mac" (or a German interpretation of Mac and Cheese) from the Little Red Riding Truck. Little Red Riding Truck's Brats and Bacon Spätzle and cheese. I was excited for this one. One of the reasons that Nikki and I get so many different Mac and Cheeses is just so we can try out many different interpretations of this simple, yet tasty dish. 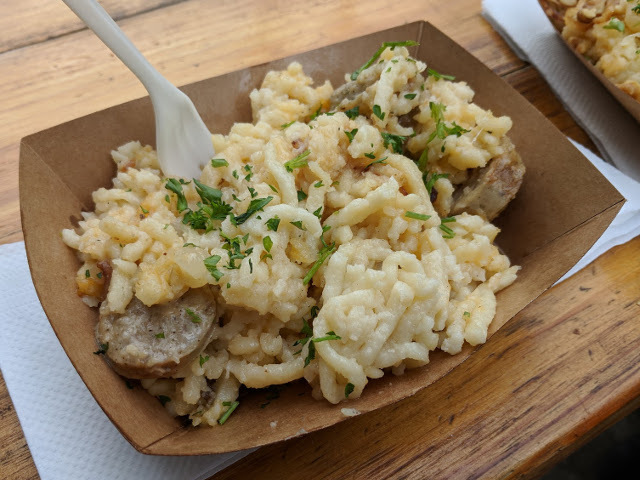 Red Riding Truck was offering a german interpretation, which used spätzle instead of macaroni noodles, and added some bratwurst into the mix. Now, I personally LOVE spätzle, but this one was merely okay. The spätzle was a little spongy, and the cheese wasn't that noticeable. Plus, the spices actually ended up making the dish taste a little like Thanksgiving stuffing. When I asked the cook in the truck which cheeses they had used, he wasn't sure, and ended up just showing us their bag of pre-shredded 50/50 cheddar/jack blend, which was... not great. Pre-shredded cheese tends to be coated in potato starch, and that totally messes with the melting. However, the bratwurst was pretty tasty, which was good, because it kinda saved this dish. Overall, I'd say this probably gets a 3 of 5. Nikki and I were both pretty full at this point, but we decided to split one last Mac from The Grilled Cheez Guys. They didn't have a food truck, and instead just set up a booth in one of the truck spots, with a bunch of butane burners, and such. I was pretty excited for this Mac, since they listed their cheeses on the menu, and you could see the chef in the back, mixing up the bechamel and taste-testing the sauces. Nikki and I ended up splitting a Tex-Mex mac and cheese. The Grilled Cheez Guys' Tex-Mex mac. With a candied Jalepeño on top. The Tex Mex mac was fairly tasty. They used a "nacho mac sauce", which consisted of Gouda, Pepper-jack, and Cream cheeses. It was very well crafted, with a pleasant consistency, and just a good taste overall. It had a faintly spicy kick with a lot of cheese flavor to back it up! The one downside to this Mac was that they WAAAY overcooked the noodles. When cooking noodles in cheese sauce, you should usually try to undercook the noodles a little at first, so the noodles don't fall end up falling apart in the sauce. The Grilled Cheez Guys didn't do that, and so the noodles were, well, falling apart in the sauce. Which was disappointing, but I'm willing to overlook that, since the sauce was so on-point. Overall: probably around a 4 out of 5. Anyways, Nikki and I had a blast at this event! I mean, it wasn't life-changing, but I was definitely glad to see Mac and cheese being taken seriously by so many people. We will definitely be coming back next year!